Trade in your reservation book. It's worth it. Never miss a customer. Accept bookings 24/7. Focus on your clients! Save time on after-hour callbacks and manual reservation correspondence. Reach new customers! Expand your customer base by accepting online bookings in no time. customers want to book online. Messaging apps are the most popular form of communication. 1.3 billion people use Facebook messaging every month! For all customers without Facebook. Integrate into your own website or link to our booking portal. Our web-based online booking can be easily integrated into existing websites. would rather message than call customer service. Off the shelf. But still tailored for you. 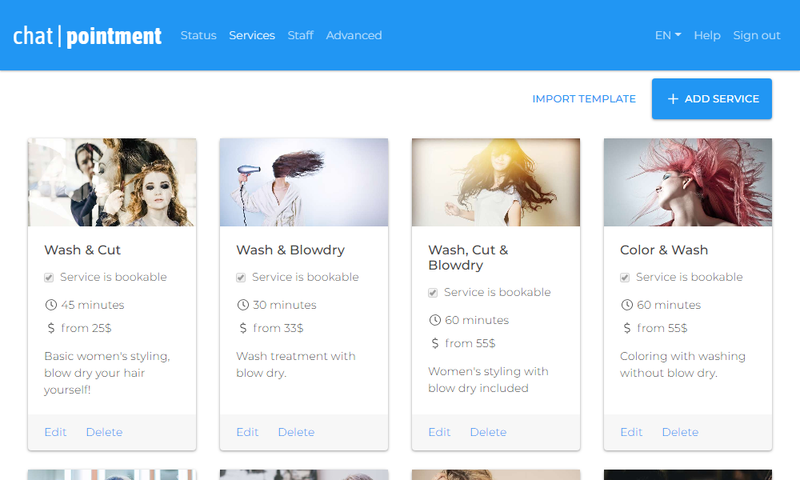 Hairstyles or facials can conveniently be booked by chat. Never miss a lead and let clients book a showing or a consultation with you. Never be disturbed again at important customer appointments. Your new online booking system makes it happen. Let your patients easily book their next appointment by themselves. Let your fitness enthusiastic customers book their next workout conveniently from their mobile phone. 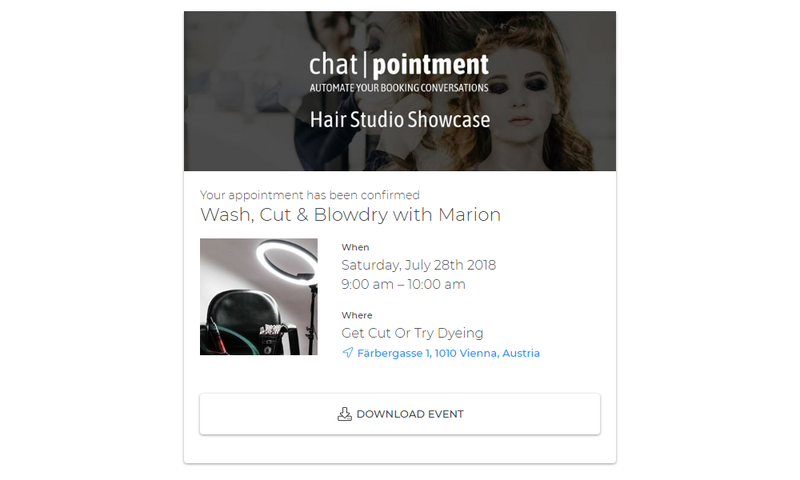 chatpointment is perfect for anyone who arranges personal appointments with his customers or clients. say a business should be available 24/7. Your new reservation book is pretty awesome. Describe your offered services and set details like duration and price. 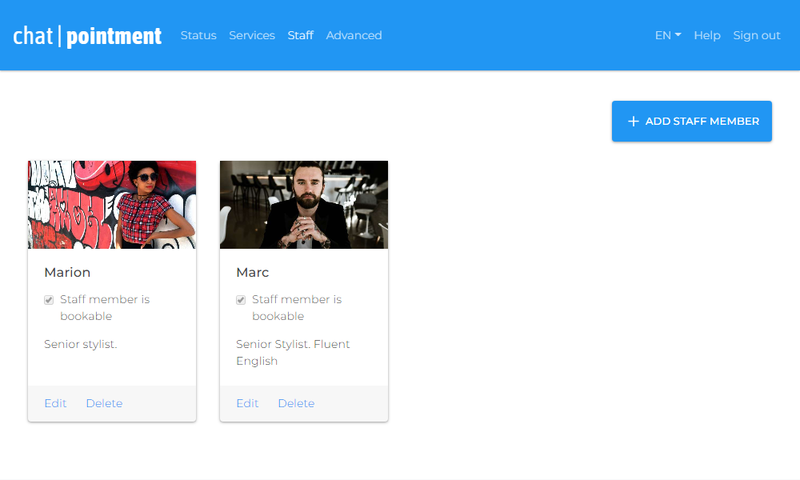 Introduce yourself and your team members in your own words. The calendar is fully yours and you can also use it for all your other bookings. Make all changes by yourself. The App shows the current status right after you login. You can make all changes by yourself! 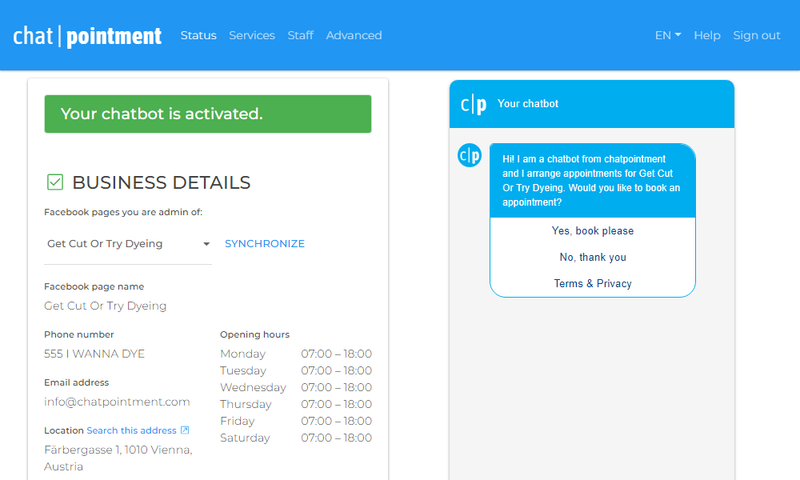 The chatbot preview (on the right) allows you to try out each change immediately. 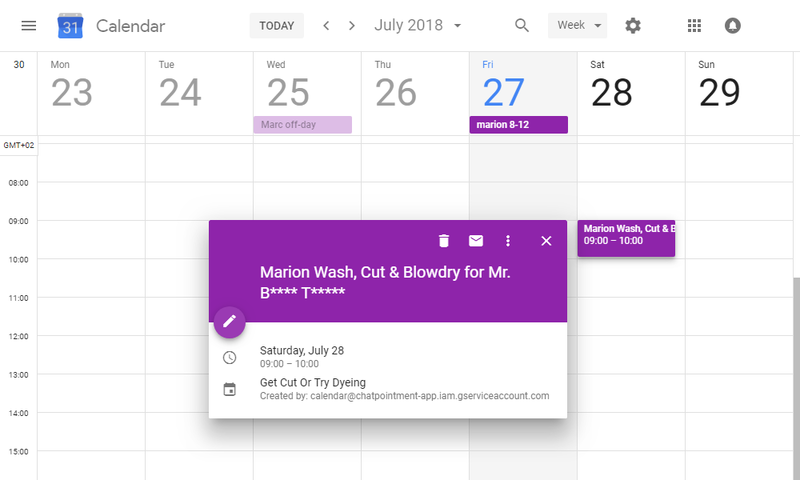 All appointments are saved in your personal Google Calendar, which we create for you. The calendar is fully yours and you can also use it for all your other bookings. Customers will receive a booking confirmation immediately after booking. The booking confirmation represents your business: images and details are tailor-made. Your online booking system can do more. Answers customer questions about opening hours. Also answers customer questions about your address, email or phone number. Answer customer questions about your products or services. prefer messaging over email to contact a business. Never miss a customer. Get started now! Join for free now. You only need a Facebook account. Connect your Facebook page, create your new Google Calendar and customize services & staff membrers. Congratulations! You can now accept online bookings. of adults and 91% of teens use messaging apps every day. Source: "Messages That Matter", Greenberg, Inc.
Booking by chat is simply convenient. It particularly appeals to younger new customers, but my regular customers can book dates easily at any time, too. 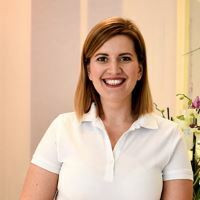 of online appointment requests are made when your business is closed. Fair pricing. No strings attached. No hidden fees. Cancelable monthly. of millennials (those under 35) only book online. Our latest product - the intelligent, digital guest directory - combines personalized offerings & guest messaging for your hotel guests.